I tested them several times until I got the filling just right, both in my oven and Skinnytaste Vremi Air Fryer that comes out early May! 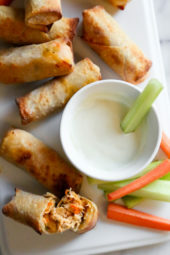 The results came out best in the air fryer, they were crispier and held their shape better. Whichever way you make them, they will still taste great. To make the filling, I used my Instant Pot but you can also use a slow cooker, I also have directions for both. If you prefer to use pre-cooked chicken, you can use the breast meat from a rotisserie chicken. If you prefer, you can swap the blue cheese for mozzarella cheese. 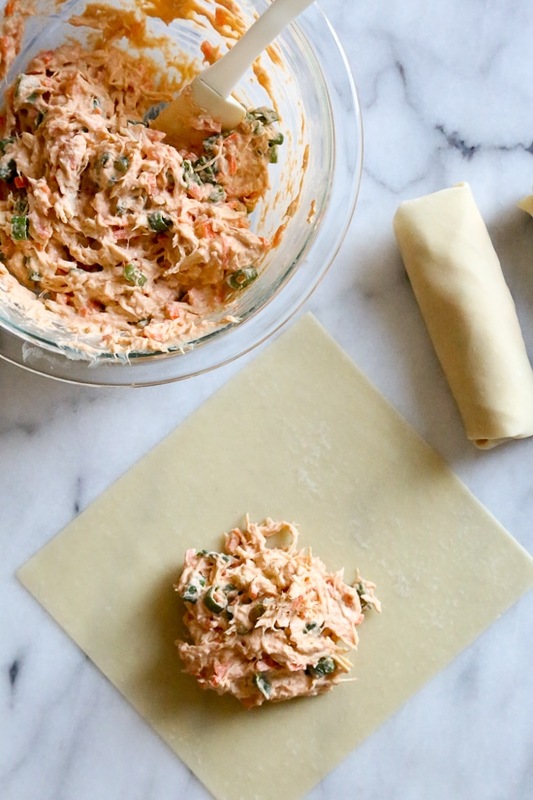 You can prep the chicken and make the filling 1 to 2 days before. 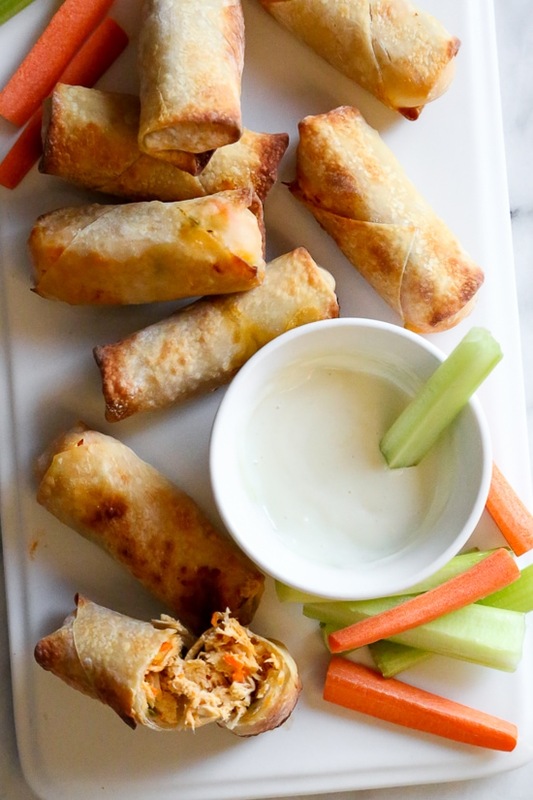 You can freeze leftover egg rolls to keep on hand anytime you need them. 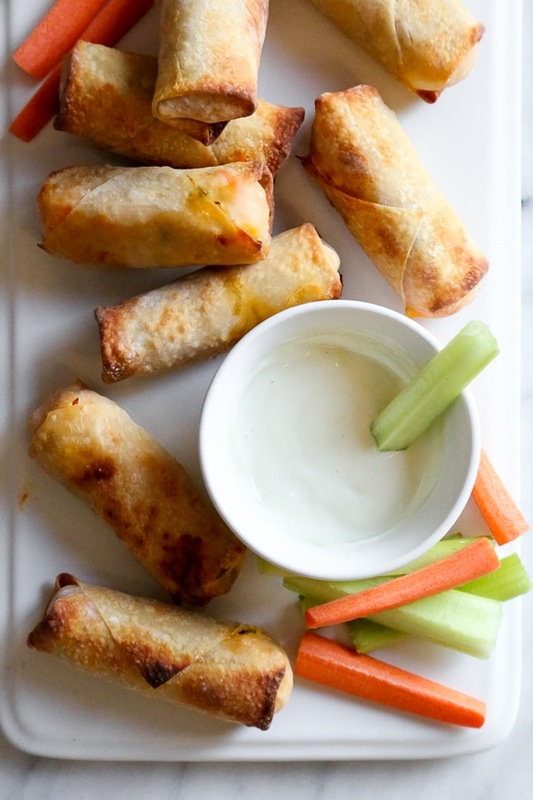 For cooked egg rolls, let them come to room temperature before freezing. Wrap them with plastic or foil, or place them in a freezer safe container. To reheat in the air fryer, heat 360F 8 to 10 minutes, until heated through. In the oven, bake 375F until heated through, about 15 to 20 minutes. Place chicken in the slow cooker and add enough water or chicken broth to cover. Cook high 4 hours. Remove and shred with two forks, discard the liquid. To make in the Instant Pot, add at least 1 cup broth or water, enough to cover the chicken. Cook on high pressure 15 minutes, natural release. Discard liquid and shred with two forks. Meanwhile, combine the cream cheese and hot sauce together until smooth. Add the blue cheese, carrots and scallions and mix well, makes 3 cups. One at a time, place egg roll wrapper on a clean surface, points facing top and bottom like a diamond. Spoon 3 tablespoons of the buffalo dip mixture onto the bottom third of the wrapper. Dip your finger in a small bowl of water and run it along the edges of the wrapper. Lift the point nearest you and wrap it around the filling. 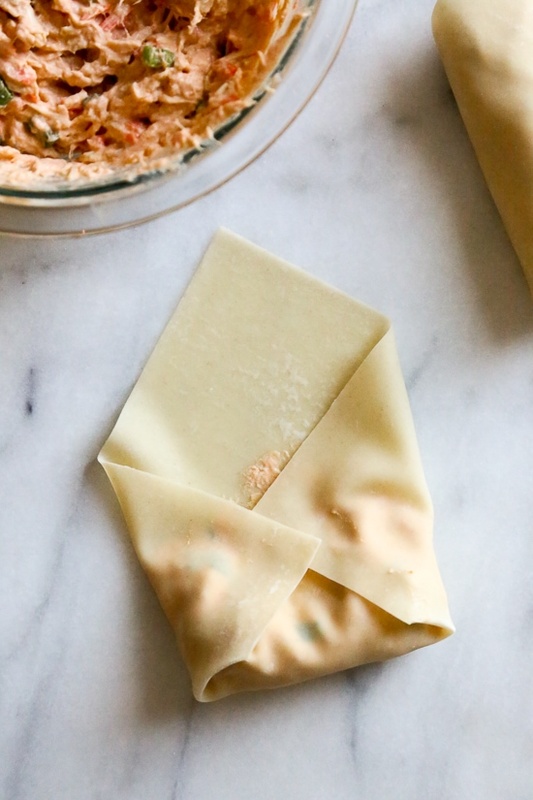 Fold the left and right corners in toward the center and continue to roll into a tight cylinder. 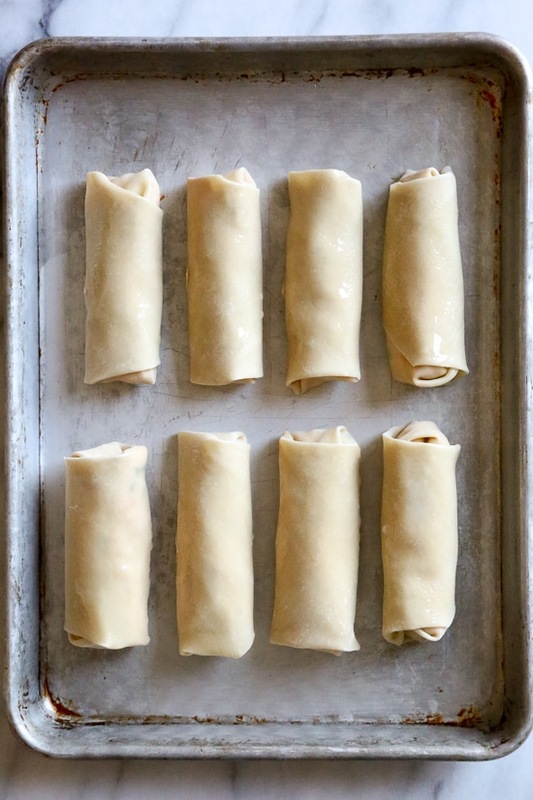 Set aside and repeat with remaining wrappers and filling. 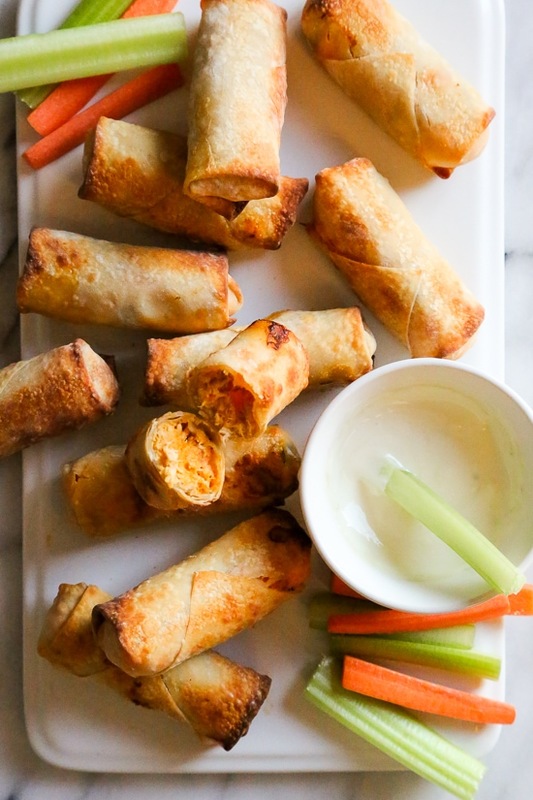 Spray all sides of the egg rolls with oil using your fingers to evenly coat. Preheat the oven to 400F. Spray a sheet pan with oil. 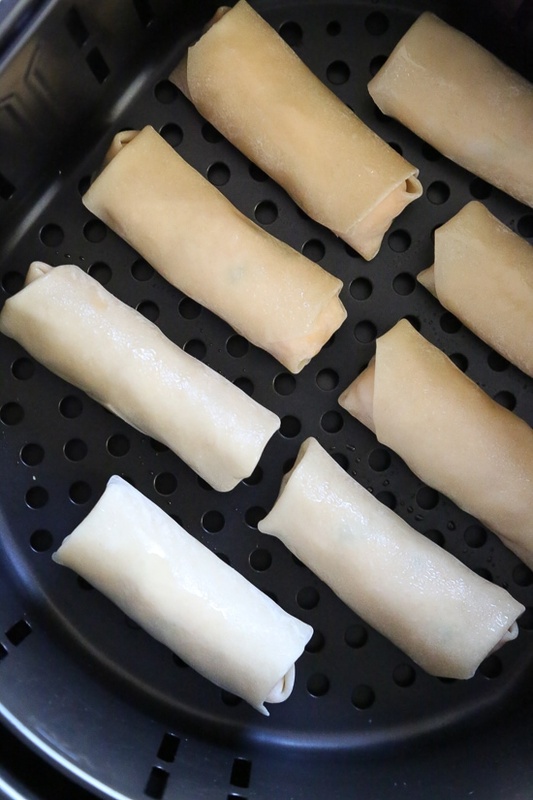 Transfer the egg rolls to the baking sheet and cook until browned and crisp, about 16 to 18 minutes, turning halfway. Serve immediately, with dipping sauce on the side, if desired. In batches, cook 370F for 8 to 9 minutes, turning halfway through until golden brown.